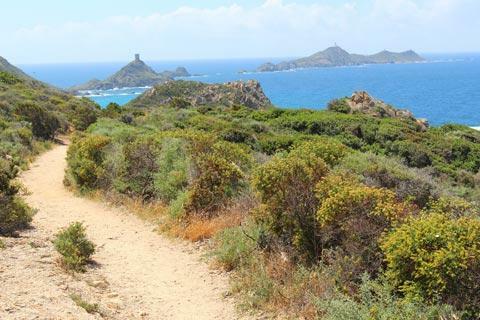 The Iles-Sanguinaires, the Parata Peninsula and the coast path between here and the Capo-di-Feno together make this one of the most scenic, and most visited, destinations around Ajaccio in south-west Corsica. 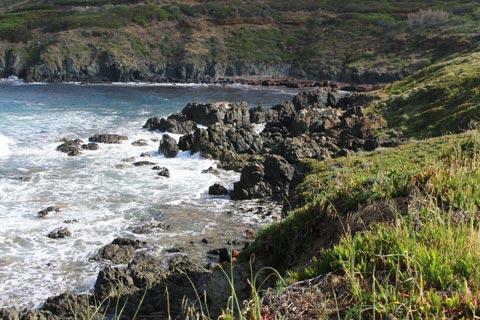 To get here follow the Route des Iles-Sanguinaires west from the centre of Ajaccio. 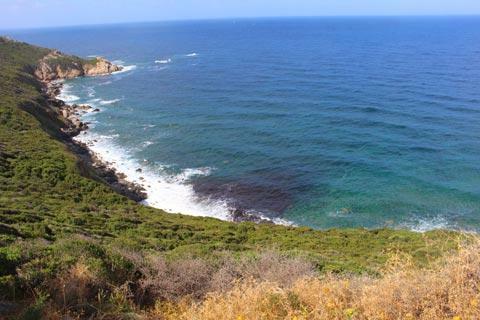 The first part of your visit is to see the Parata peninsula itself. Start perhaps with a visit to the Maison du Grand Site, the information centre near the car park area. 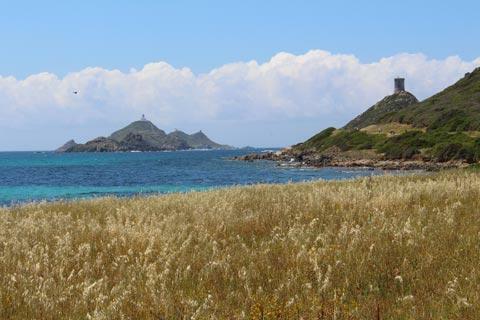 There are several options for exploring but none takes very long and each offers a different view of the Iles-Sanguinaires so we suggest you do them all! 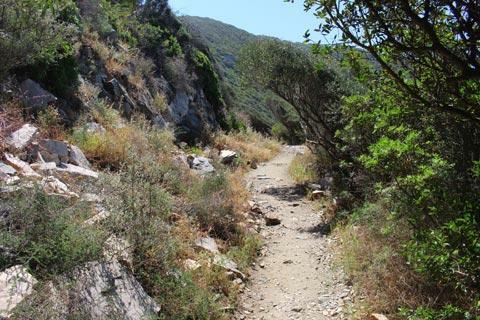 If you walk out along the peninsula itself there is a path that follows around the coast, and a second path that walk up the hill to see the tower: not a very long path but quite steep. 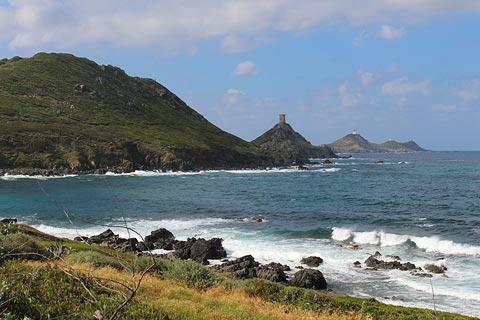 The tower was built by Giacomo Lombardo for the Genoiese in 1550-1551, as one of the many Genoise defensive towers you will see as you explore Corsica. It is also possible to walk up the larger hill just behind this one (closer to the parking). 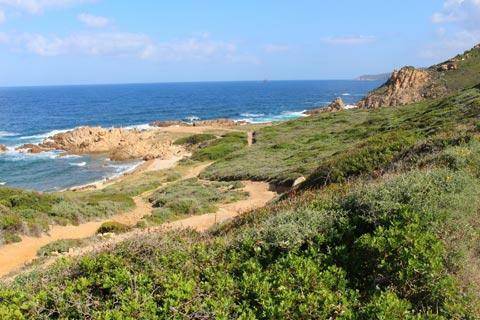 As well as admiring the coast and the scenery, wildlife enthusiasts will find many interesting plants, animals and birds to see during a visit. There is also a restaurant at the site. This is our favourite part of a visit to Parata Peninsula! 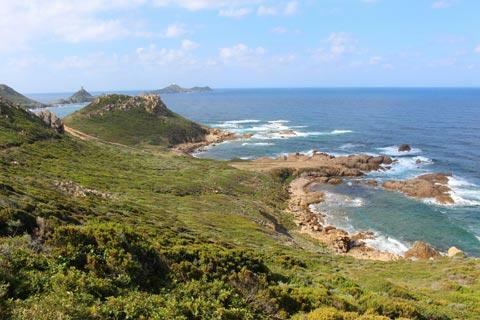 Starting on the north side of the peninsula, and following the coast to the north, there is a footpath that passes through lovely scenery and has amazing views of the Mediterranean, the rocky cliffs, and the plants that are typical of the maquis, as well as providing further views of the Iles-Sanguinaires. The path is in good condition and easy to follow, and reasonably flat most of the time, although the surface can be slightly slippery because of grit at times. 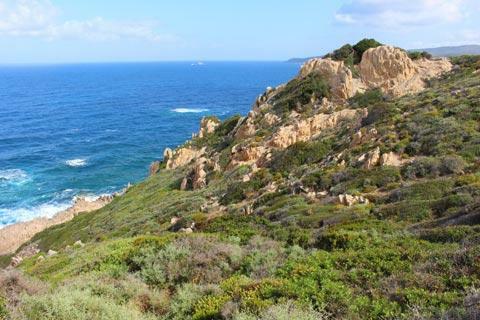 The coast path continues as far as the Capo-di-Feno where you can see two of the prettiest beaches in the region: Grand Capo and Petit Capo. 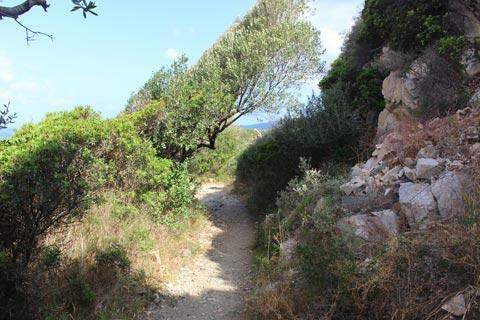 The return path from Parata to Petit Capo beach takes about 2 1/2 hours, and you should allow at least three hours if you want to continue as far as Grand Capo. These beaches do have cafes but you will still want to carry water with you for the journey! Note: the first half of the walk has better views than the second half, so if seeing the beaches is unimportant to you and it is a hot day you could always just do the first part: walk perhaps 40 minutes before turning around and returning by the same path. 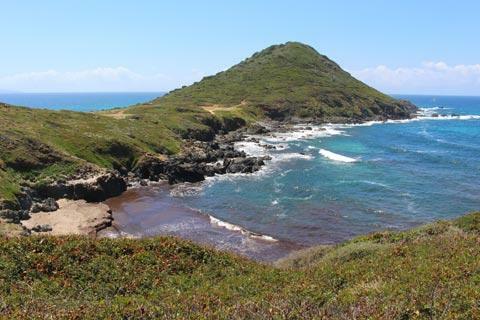 If you decided not to complete the walk suggested above you can still reach the Grand Capo and Petit Capo beaches by road: follow the D111B from its junction with the Route des Iles-Sanguinaires, a few kilometres east of the Parata peninsula. 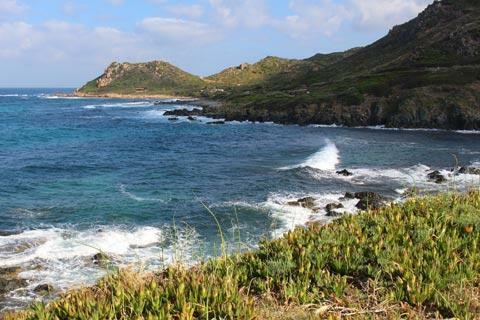 The main town in the region is Ajaccio: this is a lively and interesting town with a large harbour and many picturesque streets so allow plenty of time to explore!